Hi all are you ready for Monday? I had another productive/busy weekend...I finished a secret project for Mother's Day, cleaned my house and the church, helped Ashley with her wedding website, uploaded 35 digi pages to Costco for printing, ordered a new scrapbook to put them in, finished shopping for my mom and Mike's mom for mother's day, laundry and grocery shopping (whew...I am tired, lol!). I am so excited that I have the day off from work. One of the Doc's is out of town, so it will be pretty slow. It is a good thing because my laptop battery is having issues and I have an appointment at the Apple store today at 11am to get it fixed. And while I am over in Chandler, I am going to also pick up my digi pages from Costco ($2.99 per 12x12 sheet). I will let you know how they turned out in one of my postings this week. I am also going to finish my cupboard organization. Sarita, one of my blog readers had a super idea...she suggested using inexpensive 13x9 pans to organize the deep cupboards, that way you can just pull it out and see what is in there. I found some giant plastic baskets at Target that I am going to use for my pantry cupboard, that way the kids can just pull it out and see that we do have stuff to eat! Thanks Sarita!!!! Okay...onto the card: I made several Mother's Day cards last week, so I would be prepared to send them out on Tuesday or Wednesday (so this week may be dedicated to Mother's Day). I used my Papertrey set Little Lady and used the rock and roll technique with pretty in pink/Regal Rose ink. I really like how the shading came out, plus it is my favorite color schemes brown and pink. Thanks for visiting! Enjoy your Cinco de Mayo!!! Supplies used (all SU! 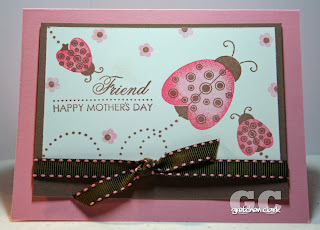 unless noted): Little Lady/Women of Life stamp sets (PTI); Pretty in Pink/Close to Cocoa/Whisper White cardstock; Pretty in Pink/Regal Rose/Close to Cocoa ink; brown stitched ribbon (Michael's).